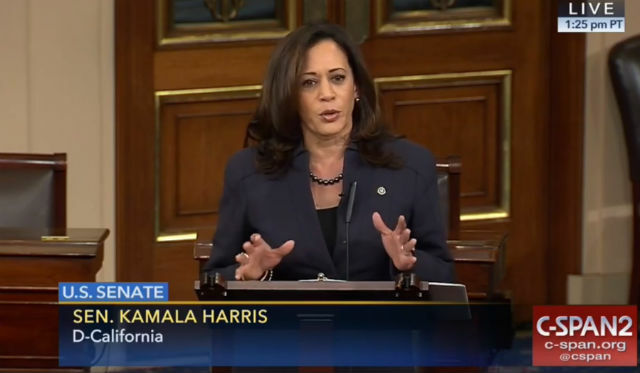 Sen. Kamala Harris said Kentucky Sen. Mitch McConnell‘s promise to allow an immigration bill to reach the Senate floor next month wasn’t sufficient for her. The Dreamers are immigrants brought to the United States as children and until recently protected from deportation by the Deferred Action for Childhood Arrivals program. Many speak only English and do not know the country of their birth. More than 200,000 live in California. President Trump campaigned against the DACA program, and canceled it last year under pressure from his right-wing base. A federal court later overturned that action and the Supreme Court is set to rule. The Dreamers have been in legal limbo, with deportations potentially beginning as early as March. Sen. Dianne Feinstein, the state’s senior Senator, also cited the lack of help for the Dreamers in her vote against the measure. “I voted no on the bill today for one reason: It didn’t include the Dream Act, as has been repeatedly promised. I’m frustrated and angry that once again we were prevented from voting on that bill,” she said in a statement.